Arin Magill, Executive Director, La Conner Sunrise Food Bank, accepts a donation while Maureen Harlan, SI La Conner president, looks on. SI La Conner donated $2,420 plus food items to the La Conner Sunrise Food Bank in February. The donation was awarded at the Soroptimist International Area Meeting held in La Conner at Maple Hall on Saturday, February 21. 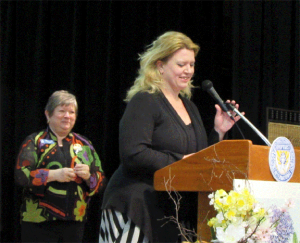 The meeting was hosted by SI La Conner and attended by 180 women from twelve SI clubs in Skagit, Island and Snohomish counties. © 2019 Vintage La Conner Thrift and Consignment Shop.